Footwear racks are commonly used in footwear retail outlets, shopping malls, exhibitions, sales showrooms, etc. 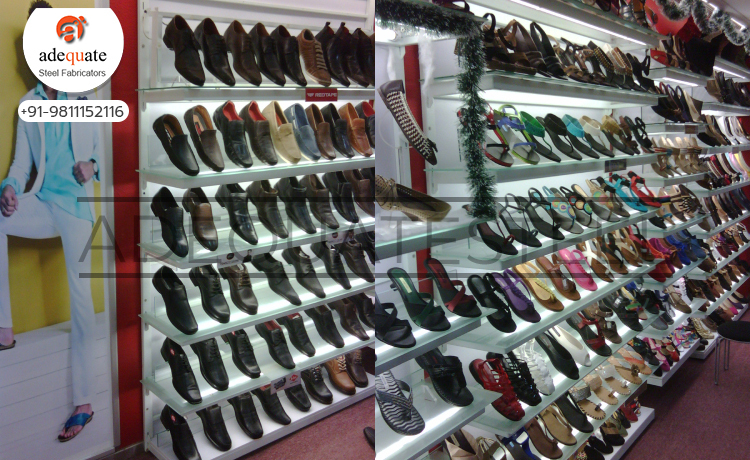 These help to showcase different types of footwear and for luring customers into a footwear shop. In short it needs to be a display as well as an indirect promotional system. Hence, the important of having the right display racking system in place for a footwear outlet. Adequate Steel offers the best choices when it comes to ideal footwear racking systems which largely depends on the kind of footwear on display, the number of models that will be displayed, the available showroom floor space, target market segment, etc. Adequate Steel offers standardized choices that can fit into the floor plan of any retail footwear showroom depending on the need and requirement of the client. Footwear racks from Adequate Steel are offered in four standard types, namely; metal slat wall shoe racks, glass shoe racks, mesh stopper shoe racks and footwear racks. It is important for footwear racks to have a combination of both display as well as storage facilities and hence Adequate Steel has made sure that it offers both for its customers to choose. Metal slat racks are popularly used for display while the other three are used as a combination of both display and storage purposes. Footwear glass racks can be used for both storage and display purposes. These racks from Adequate Steel come at variable dimensions and the most suited can be chosen as per the requirement of the client.